Plant-based protein products have been stocked in grocery stores for decades. But as consumer appetites for vegan and vegetarian food grow, a number of recent high-profile mergers and acquisitions are serving up a disruption to traditional food corporations. One of the biggest commitments to the growth of plant-based alternatives came this week when one of Canada’s largest food processors, Maple Leaf Foods Inc. (MFI.TO), announced it’s building a US$310 million plant-based protein facility near Indianapolis. Maple Leaf started investing in the meatless space five years ago, and subsequently acquired Lightlife Foods and Field Roast Grain Meat Co. in 2017 to serve as the foundation of its alternatives business. The Mississauga, Ont.-based company’s newly-announced plant in Shelbyville, Indiana will double the current production rate of Lightlife and Field Roast’s products under those two brands. 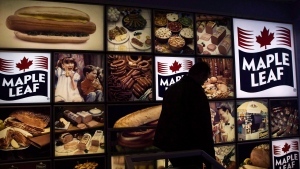 Food giants like Maple Leaf aren’t too worried about cannibalizing sales from their traditional offerings, said McCauley, as rising meat prices suggest consumers eventually may not want, or be able to afford, to eat meat every single night. Impossible Foods is a Silicon Valley-based startup that has products available in thousands of locations around the world. The company’s signature product is the Impossible Burger, made from an ingredient extracted from soybeans called leghemoglobin, which allows the burger to resemble some beef-like qualities. Impossible made a big move in early April, announcing a partnership with Burger King to sell the Impossible Whopper at locations in St. Louis, Missouri. Impossible Chief Operating Officer David Lee says that if the burger takes off with customers, the product will be rolled out to all Burger King locations. Burger King is testing the meatless Impossible Burger at 59 locations in St. Louis, Missouri with an eye to roll out the product nationally if the trial goes well. BNN Bloomberg speaks to David Lee, COO and CFO of Impossible Foods about the startup's latest developments. Beyond Meat makes plant-based burgers, sausages and chicken, and is the only private company in this space to have filed for an initial public offering. It was also the first plant-based burger to be sold in supermarkets’ frozen sections. Beyond has attracted a number of notable investors including Bill Gates, Leonardo DiCaprio, American food giant Tyson Foods Inc. (TSN.N), and also has a fast-food partnership with A&W Restaurants Inc.
Chris Kerr, Chief Investment Officer of New Crop Capital, says it is crucial for private firms in the vegan food business to partner up with larger corporations or fund their next phase of growth by going public. M&A activity in the plant-based sector has increased sevenfold since 2016, Kerr adds, as companies struggle to keep up with demand for meat alternatives. Tyson Foods is an American corporation that owns five per cent of Beyond Meat. Its initial investment in 2016 made it one of the first major meat processors to invest in alternative proteins. McCauley says a food giant like Tyson getting involved in this space is a preemptive measure. Nestlé SA is another multinational corporation involved in the race to meet growing consumer demand for vegan and vegetarian products. Earlier this month the Swedish food giant unveiled its so-called Incredible Burger under its Garden Gourmet brand. The company says the product will hit frozen food aisles in Europe later this month, and U.S. markets later this year.